The Print Box is offering customers and their clients the opportunity to capture the CO2 emissions from their paper purchases by planting native woodland, right here in the UK, through the Woodland Trust and the Woodland Carbon scheme. When you place your print order you may elect to capture the carbon from the manufacture and distribution of the paper. The amount of CO2 generated in the production and delivery of your paper is calculated. 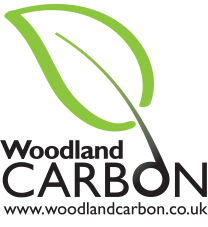 The Woodland Carbon logo may be used in conjunction with the print job to demonstrate your commitment to using reduced CO2 paper. All Carbon Capture charges will be paid to the Woodland Trust who will plant woodland at one of their accredited woodland creation sites in the UK. 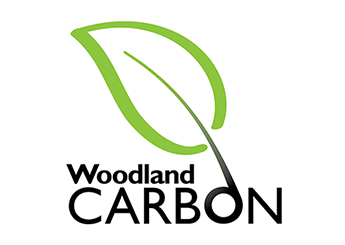 Woodland Carbon is an accredited, award-winning carbon removal scheme that is operated under the Government’s 2011 Woodland Carbon Code. Organisations looking to reduce their environmental impact and mitigate their carbon emissions can fund tree planting with the Woodland Trust, the UK’s leading woodland conservation charity. It is estimated that 25m2 of native British woodland captures and stores at least 1 tonne of CO2. When you choose to Carbon Capture your print jobs from The Print Box, you may use a specially developed logo on all print jobs where the CO2 has been captured from the paper purchases. The logo will contain a reference number providing confirmation and traceability. Using the Woodland Carbon logo enhances your brand and reinforces your environmental message. The UK is one of the least wooded countries in Europe, with just 13 per cent tree cover compared to the European average of 44 per cent. The Woodland Trust has established home-grown woodland creation projects that offer companies the chance to mitigate their CO2 emissions. At the same time, organisations will also be supporting projects that improve biodiversity, enhance social well-being, help the landscape adapt to climate change and ensure the UK is no longer one of the least wooded nations in Europe. 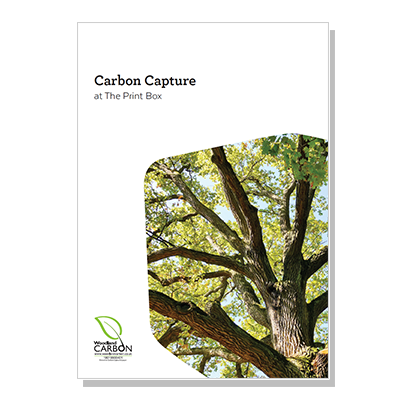 Woodland Carbon provides a strong external message but also has tangible outcomes – trees that can be seen and visited throughout the UK.